Ideally suited for soil and asphalt testing, the Despatch LBB series ovens feature fast heat-up rates and precise, easy-to-read digital controls. Powerful heating elements bring the oven to temperature very quickly, resulting in fast test results and improved sample quality. Digital controls deliver precise temperature and a large LED panel makes it easy to monitor oven temperatures. The LBB series ovens operate at temperatures up to 400°F (204°C) and use forced convection airflow for uniform temperatures throughout the oven chamber. Standard shelves can handle up to 50 lbs. (22.7kg) and are easy to slide out and reposition. Shelves that can handle 200 lbs. (90.7kg) of material are available as an option. 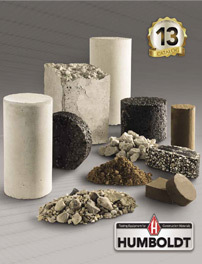 Meets AASHTO uniformity requirements of ±3° at 150°C. Motor and fan are located above the stainless steel oven chamber to prevent damage if materials are spilled.